Recently I’ve been getting a lot of people asking me how to sell digital goods at real-world events. I think this is great! I started on this path 15 years ago with a client who has published more than 50 books, several audio courses and over a dozen DVDs. We had just built an ecommerce site for him (osCommerce). He was doing very well online, but still schlepping books and videos around to live events (VHS tapes back then). A couple of years later, I was tired of messing with free shopping cart systems that barely worked, took hours to add any additional functionality, and were designed by programmers, not salespeople and marketers (i.e. no attention to conversion… the whole point of having an online store). Once we worked the bugs out of the base system and started adding more advanced features, the subject of selling digital products in the real world came back up. By that time, we had learned a lot about how it should work. But keep in mind that this was still the mid-2000s. YouTube had just been founded and was far from the household name it is today. So we did what we always do: we started trying things and asking for feedback. Needless to say, many of our ideas, while great on paper, turned out to be duds in the long run. A decade later, we have a very advanced, yet easy-to-use system that seems to fit all the necessary requirements and avoid most of the frustrations (hey, no system is perfect). If you’re reading this and want to learn more about our system, please contact me. But if you’re looking to do this on your own, the following should help you avoid some of the bigger pitfalls we’ve come across. In this sort of scenario, you have two problems to solve: getting them to buy an intangible product and then giving them access to the content. These are typically at odds with one another. Without an automated system, every step you take to make it easier for the purchaser to buy typically means more work on your end. Here are some options we’ve explored, and the lessons learned. In essence, you make an offer to the audience and tell them that if they give you their email address, you will email them with details on how to collect on the offer. Once you’re done, either immediately after your presentation or days later, you add the people to your list and shoot them a link to your landing page. If your copywriting skills, and the offer, are both good then you might be able to convert a few people. Of course, the longer you wait, the less likely they’ll buy… especially if there are other people selling in real-time at the event. This option is about as low-level as you can get, but also means you basically make no money at the event. Yes, you can add to your email list, but then you have to get them to convert much later, after all the fire and pizazz of your presentation are long forgotten. Have them sign up via your tablet, not a piece of paper (which takes unnecessary time to convert; plus you’ll lose several people because of poor penmanship). Bring along an external keyboard. Nobody likes typing on the on-screen tablet keyboard. Plus this will help keep your screen from getting damaged. Create a special signup page for each event, along with at least one custom variable to allow you to track and target the signups from that one event. 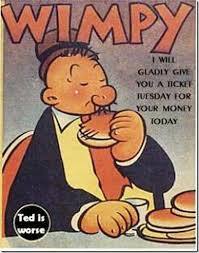 I’d gladly pay you Tuesday for a hamburger today! If you don’t understand the above sentence, you’re either too young to remember the Popeye cartoons (sad). This option is pretty-much the opposite of what Wimpy was trying to do. You’ve got your Square (or PayPal Reader or card swipe machine). So you take payment, collect their contact information, and give them “something” in return. Done correctly, this is the way to go. But getting it right is very difficult, even on a technical level. There are three main problems to solve: buyer psychology, security and data collection. If you’re going to provide something that’s not the actual product, you need to make absolutely sure they buyer is confident they’ll get their stuff. If you’re just collecting their contact info, with the promise of sending it too them later, most people will pass. It’s sad but, as a society, we just don’t trust each other like we used to. But you can give them a card or something with login info, right? Sure, but then we get into the security issue. Unless whatever is on that card is utterly unique and one-time-use-only, what’s to keep them from just passing it around? It doesn’t matter how much information you specify (usernames, passwords, keys, etc. ), they’ll still all fit in one Tweet to their 10,000 followers. The other option is to sign them up right then and there. This is certainly an option, but also fraught with potential problems. Assuming you’ve done a good job with your presentation, there will be a stampede to the back of the room. You know how it can get! Now imagine that instead of just filling out a form and producing a credit card, they need to sign up for an online account. That means typing, choosing (and remembering) a password, entering credit card information online… and this all assuming that the WiFi at the event is working! I suppose, on one level, this is a good problem to have! I don’t want to be all “doom and gloom” on you. That’s just not in my nature. But keep in mind that we’re dealing with some pretty advanced topics here. There is yet another solution that gets a bit closer to what we eventually developed for our system. Since I do have a business to run, and would love to have you as a customer, I’m not going to give away all of our secrets. Prep: Start with a database. It could be something as simple as an Excel spreadsheet. Now find a random alphanumeric code generator. Generate a bunch of codes (more than you might expect to sell at the event, just in case) and stick them in your database. Now go get some address label sheets. Depending on how much info you want on the label, you can get anything from a 30-label sheet (2.625” x 1”) to a 10-label sheet (4” x 2”). Download the label template and create one label for each code, with whatever other information you want on it. Sales: Take orders via whatever method you want. Whenever someone buys, you peel off a sticker and put it on whatever flyer or card you had printed for the offer. Then enter the person’s information in your database entry for that code. I suggest name, phone and email, just in case you need to get in touch with them (and to put them on your list). Data Entry: Once you’re back in the office, go into whatever system you’re using to deliver content, setup accounts for each person and give them access to the content. Of course, I’m assuming that your software has some way to handle this part. You’ll need to make sure they get an email with their temporary login information and instructions on how to access the content. Here’s a quick tip for increasing sales in these types of situations: include something physical. Even if it’s some simple piece of schwag, there’s something about walking away with a tangible item that helps sell. If you have some old CDs or DVDs, this is the perfect time to put them in paper sleeves and give them away. I realize this suggestion is probably more than most people want to get into. Even on a technical level, without the right system, it can be more effort than it’s worth. But with the right system and the right offer, you can increase your long-term sales exponentially. Do someone hear a cash register ringing? I hope this post answers more questions than it raises. As I said, this is a fairly advanced topic. If you have questions, or would like to know more about our solutions in this area, please contact me. I would love to help… even if that means answering some more of your questions. NextWant More Success? Have Some Pie!